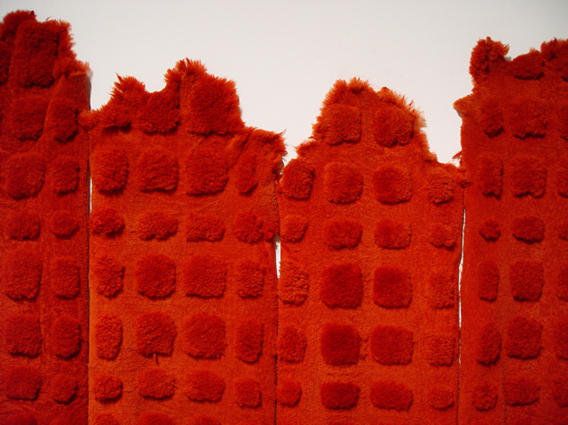 Image: Maria Fernanda Cardoso, Sheep (Red) (detail), 2002, dyed sheep skins, dimensions variable. MARIA FERNANDA CARDOSO is featured in Materiales en expansión, opening today. Curated by María Teresa Guerrero, the exhibition celebrates 30 years of the Espacio Alterno Gallery at the University of Los Andes, Bogotá, Colombia. 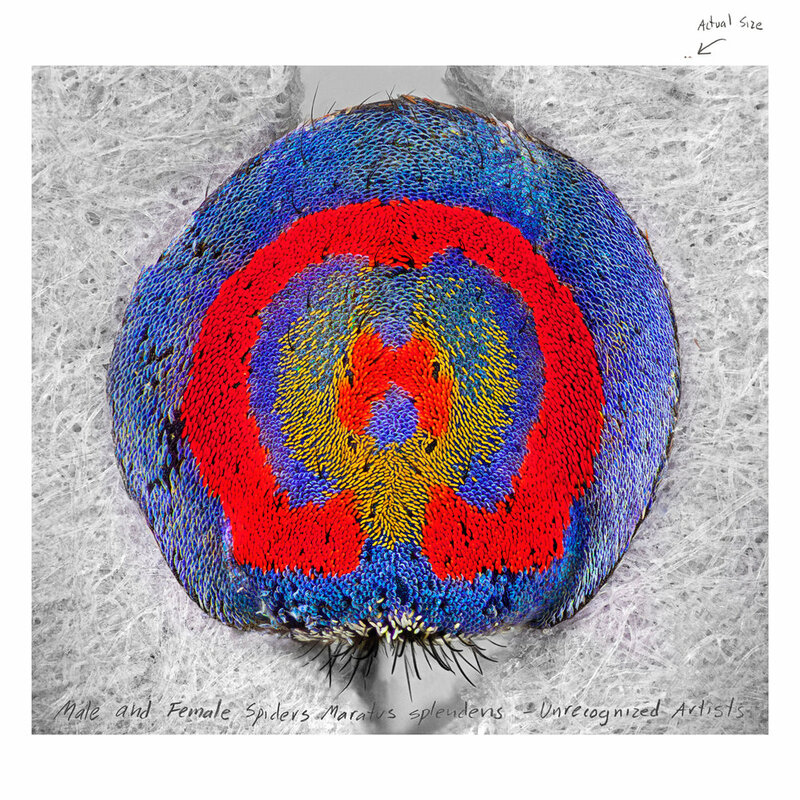 Maria Fernanda Cardoso, Male peacock spider, whole body, Maratus speciosus, pigment print, 2018, 152 x 152 cm. See eight different kinds of Maratus spiders singing and dancing at the world premier of MARIA FERNANDA CARDOSO's On the Origins of Art III–VIII. The screening will be at Bundanon Homestead from 6.30 –9.30 pm Saturday September 29 as part of MICRO: Little things mean a lot. The Bundanon’s annual spring event brings scientists, artists and community voices together to share knowledge and ideas arising from the Bundanon sites through discussions, presentations and experiences. For more information, click here. MARIA FERNANDA CARDOSO will create a major new series of sculptures from approximately 4,000 cubic-metres of ‘yellow Sydney’ sandstone, harvested and commissioned by TWT Property Group. The sandstone has been quarried from 15 layers on the site of TWT's upcoming NewLife Pyrmont development and will be incorporated into the design of the buildings. Cardoso was selected from a list of leading Australian artists. Her proposal was selected as the most outstanding site-specific concept reflecting the beauty and importance of the sandstone. 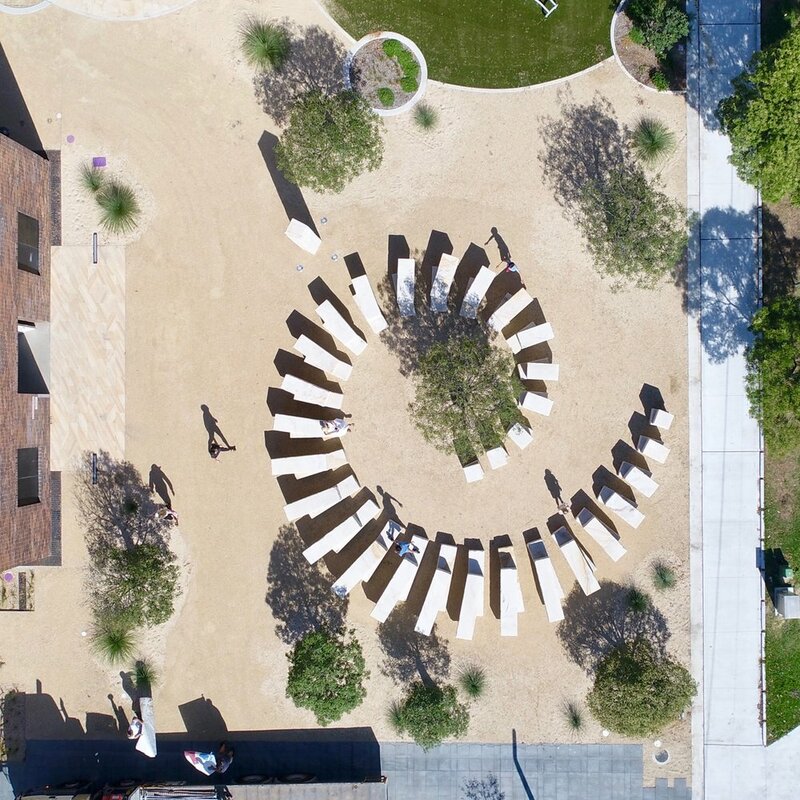 MARIA FERNANDA CARDOSO has an amazing new public artwork in Green Square, the City of Sydney’s new community and cultural precinct. MARIA FERNANDA's work, While I Live I Will Grow' sits at the entrance of the precinct and is made of sandstone and Queensland bottle trees. The precinct will be launched officially on Saturday 26 May and MARIA FERNANDA will be in conversation with Green Square curatorial advisor Amanda Sharrad between 1.30pm – 2pm. Maria Fernanda Cardoso, Where I Live I Grow, sandstone, queensland bottle trees, 2018. Maria Fernanda Cardoso, Actual Size II, 2015, pigment print on premium photo paper 300 grams. Major works by MARIA FERNANDA CARDOSO, including Actual Size I and Actual Size II have been acquired by the Tate London and the Museum of Contemporary Art, as part of a joint acquisition program that aims to bring Australian art into the international spotlight. These works were shown at the beginning of the year at ARC ONE gallery in the exhibition, The Art of Seduction. In this exhibition, Cardoso looked at the complex behaviour of miniscule animals to explore notions of sexual selection and how that might relate to our aesthetic sense. Along with the spectacular video work On the Origins of Art, this body of work also represented Australia in the Cuenca Biennial. Elizabeth Ann Macgregor, Director of the MCA has said that the works will be shared by both major institutions. MARIA FERNANDA CARDOSO's 'The Art of Seduction' has been featured in the Good Weekend Magazine, on Saturday 17 February. You can read John McDonald's article here. Maria Fernanda Cardoso, Look at me! I am an artist from Australia. Maratus splendens, 2018, lenticular print, 10.2 x 15.2cm. MARIA FERNANDA CARDOSO's works will be shown in Chaos & Order: 120 Years of Collecting at RMIT, an exhibition which will run at RMIT Gallery from 13 April to 9 June 2018. Drawn from the University Art Collection, Chaos & Order is an ambitious survey of artwork collected by RMIT over the last century. Maria Fernanda Cardoso, Naked Flower #1: One wife, three husbands, 2013, digital print, acrylic face mounted on aluminium, 45 x 30 cm. Shepparton Art Museum's summer exhibition, Cover Versions: Mimicry and Resistance, explored ideas around mimicry and impersonation, re-performance or reiteration—expanding on the notion of the cover version and its subversive potential within the digital age. Image: Maria Fernanda Cardoso, Leaves / Hojas, installation view, 2017, courtesy Shepparton Art Museum as part of Cover Versions: Mimicry and Resistance. Image: Serana Hunt. Maria Fernanda Cardoso, Intromitent organ of the Allonuncia Grandis 2(Harvestman) Opiliones, 2009. 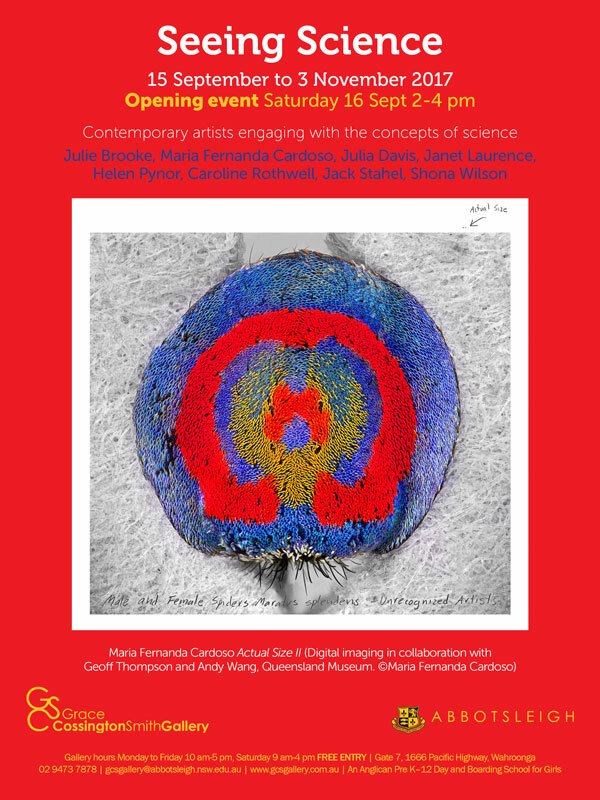 MARIA FERNANDA CARDOSO's work will be included in Le monde tel qu'il va! [The World as it is!] as part of Les Rencontres d'Arles, France. The eight free exhibitions run from 1 November 2017 to 7 January 2018 at the J1 Hanger, Quay of the Joliette in Marseille. MARIA FERNANDA CARDOSO is working on a major public installation for Green Square in Sydney. Titled While I Live I Will Grow, the work features a large spiral sandstone sculpture is centre stage in a bottle tree colony that will, over time, mature into magnificent bottle-shaped giants. The trees will grow together alongside communities in the new suburb of Green Square. While I Live I Will Grow will be on view in Green Square from December 2017. Maria Fernanda Cardoso with a maquette for While I LIve I Will Grow. Image courtesy of City of Sydney. Congratulations to MARIA FERNANDA CARDOSO and NIKE SAVVAS, who have been invited to show work in the 2018 Adelaide Biennial of Australian Art, curated by Erica Green, founding Director of the Anne & Gordon Samstag Museum of Art. Inaugurated in 1990, the Adelaide Biennial is the country’s longest-running survey of contemporary Australian art and an important platform for Australian artists to realise new works and projects of a scale that require an institutional context for their conception, realisation and presentation.